I'm bringing back my raisin pudding for Flashback Friday. 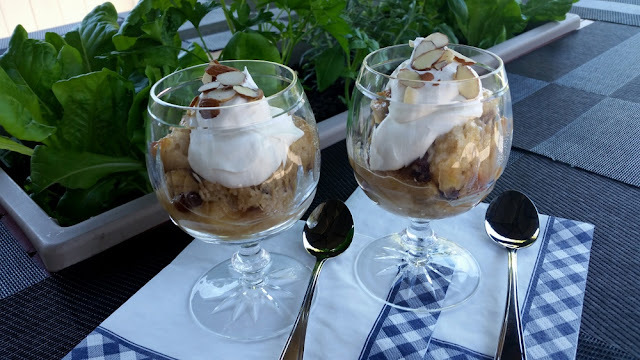 It is sometimes known as poor man's pudding but if you spoon it into nice goblets with a dollop of whipping cream and a sprinkle of almonds on top it looks fancy enough for company. I changed up a few things when I made it this time, I decreased the amount of raisins and added shredded apple. I also increased buttermilk. I found that with a little increase of buttermilk the dough was easier to spoon into the baking dish. In a medium sized bowl whisk together flour, sugar, baking powder, salt, cinnamon, and nutmeg. Cut in butter until mixture is crumbly in texture. Stir in raisins and apple. Gradually add buttermilk stirring lightly with fork just until blended. Spoon batter into a 1 1/2 quart baking dish, the batter will be fairly thick. Whisk together sauce and pour slowly over batter. Bake in a 375º oven for 30 minutes. Allow to cool in baking dish for 15 minutes before serving. This allows the sauce to thicken. I must give this a try....I have never heard of raising pudding before. It looks and sounds delicious! That looks delicious Betty, reminding me of my mom's raison pudding. ! I love how you fancied it up for serving too. Yum! 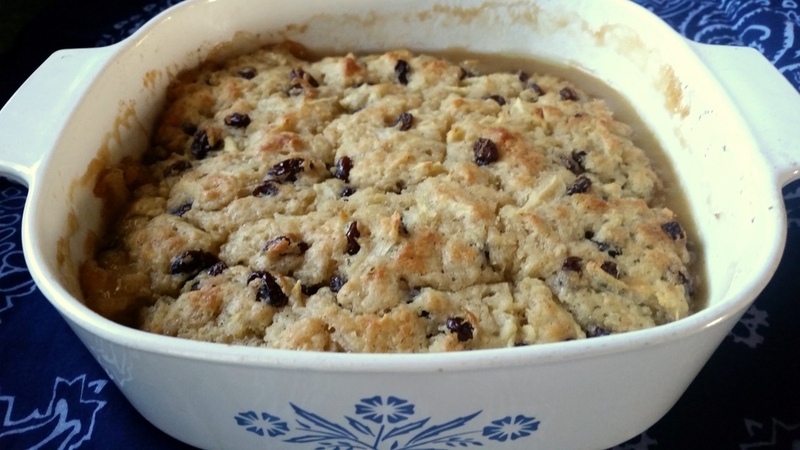 This is very similar to a recipe that my Mom always made and she called it "Radio pudding". When I asked about the name, she said that she got the recipe from a radio show but missed what it was actually called. So Radio Pudding is what it's called in our home!! I like the idea of adding cinnamon to it and will try that next time. I, too have always known this as "Radio Pudding" and I heard that it was because the radio shows in the older days used to be 30 minutes long, and that was how long it took to make the pudding! Looks very yummy, sort of a forgotten recipe! Looks like a raisin cobbler. I love hot/warm puddings and this sounds lovely, especially as it is winter here.